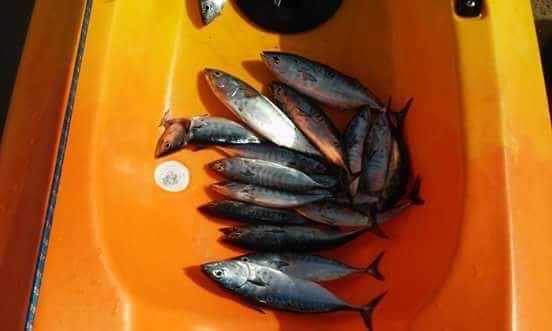 Sea Kayak Halkidiki is proud to organize, and offer its customers the first guided Fishing Kayak Classes in the bay of Vourvourou at the Sithonia peninsula of Halkidiki. Kayak fishing is one of the fastest growing segments of the sports fishing industry. With a fishing kayak, you have access to fishing areas that others cannot reach. 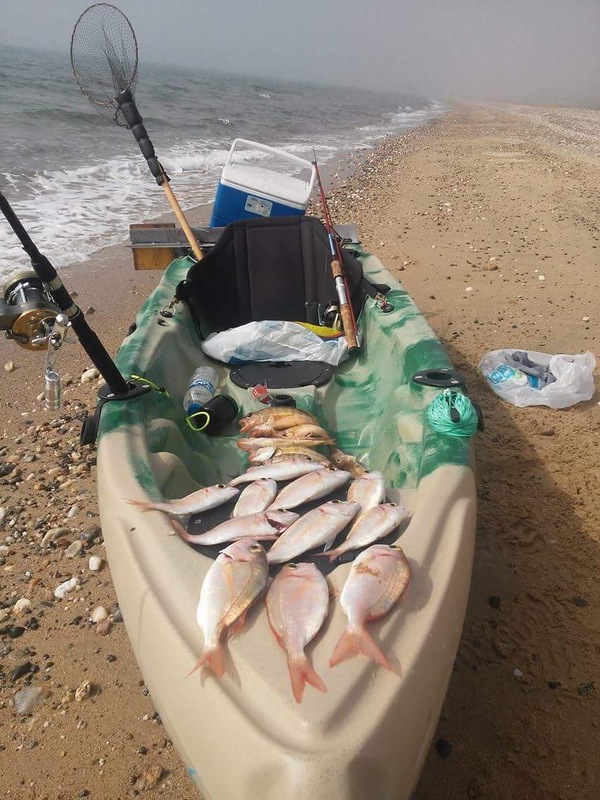 Whether fly fishing, troll fishing or even angling fishing, kayak fishing it is a great way to sport fish while enjoying the beauty and wildlife of the Vourvourou bay. No Kayaking experience necessary! Great for beginners, groups and families. Ultimate fishing kayaking experience in Halkidiki. Great for first-timers! Calm water, beautiful Vourvourou bay scenery excellent for swimming and snorkeling. 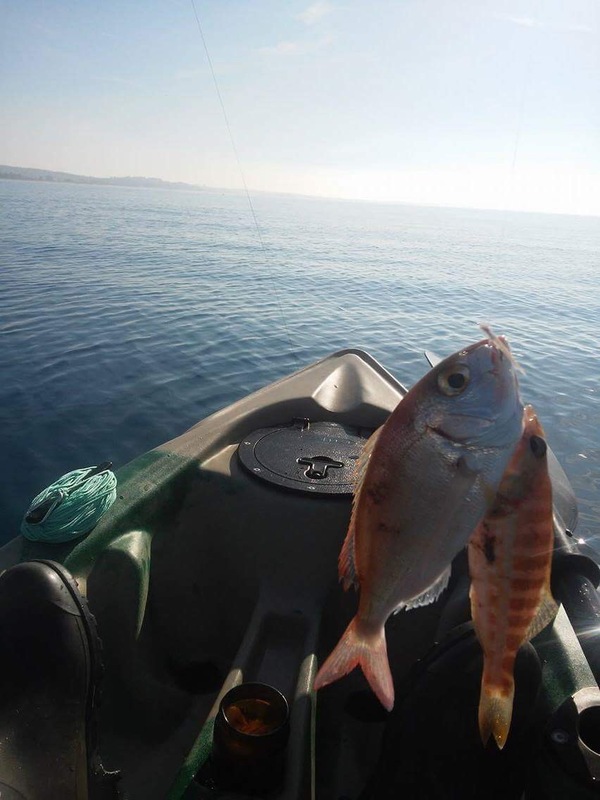 Sea Kayak Halkidiki offers small to medium-size group Guided Kayak Fishing Classes to carefully selected fishing spots. 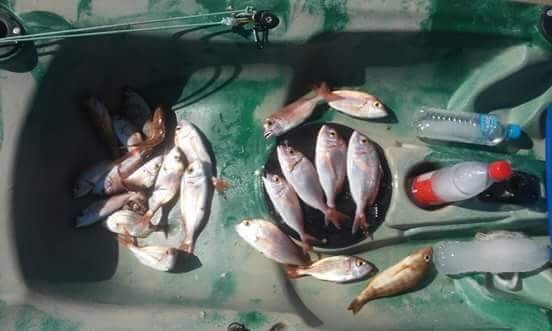 Departing from the protected location of Vourvourou resort, anglers are guided through the pristine waters of the area to fish for pandoras, sea breams, black sea breams, bluefish, combers, horse mackerels, chub mackerels, Atlantic bonitos, and many other epipelagic and mesopelagic fish. The areas surrounding Vourvourou bay in Sithonia are some of the most wonderful fishing grounds for kayak fishing. Waters are sheltered, calm and rarely fished. 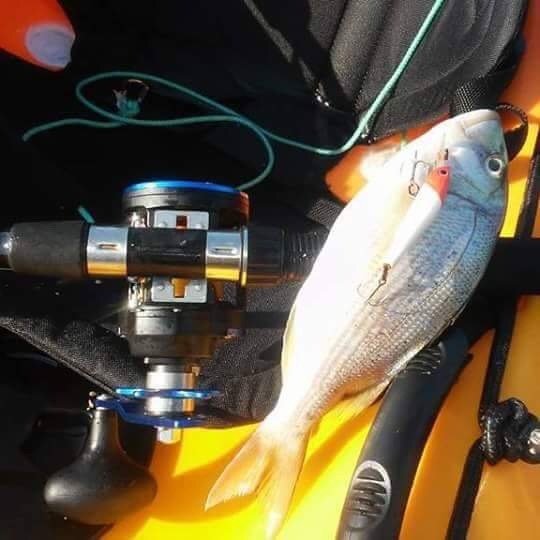 Perfect for trolling and angling fishing from our sea kayaks. On average this 5 hours Kayak Fishing trip includes a 30 minutes preparation time, 1 hour paddling exploration to the fishing grounds and 3 hours approximately on-board the kayaks for fishing and 1 hour free time for relaxation, snorkeling, swimming, photographing and more. . . Snacks, fruits and water are also included! 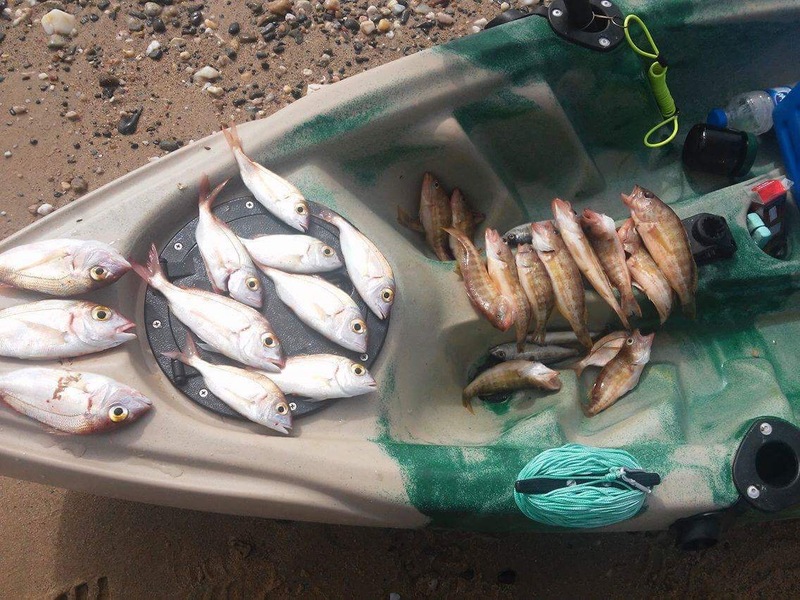 Our professional kayak fishing instructor has the experience, expertise and resources to make your fishing trip to Vourvourou a trip to remember for life. DEPARTURE TIME Please arrive by 07:30 for a prompt departure at 08:00. YOU SHOULD BRING Hat, sunglasses, towel, sunscreen. Transportation available upon request. Additional fees apply. Please note that the exact details of your trip will depend on both the weather conditions, and the other people in the group. In case of bad weather cancellation, you will be provided with an alternative trip at the same cost, or you will be fully refunded. Selecting the spots where we choose to fish depends on the local weather conditions on the day of the trip, or even your fishing preferences. Different seasons favor different species, but most species can be targeted all-year round! Also, here you can find information in order to prepare for your trip. Charges are made in USD at the exact daily exchange rate. Customers paying with credit cards in different currencies may incur nominal bank charges for transacting in USD. Please, contact your bank if in doubt about their charging policy. Also, please note that there is a 5.5% booking fee on all online bookings and payments. We start this special trip with a short lesson on the beach to go over the elements of kayaking including safety issues, proper paddling techniques, steering and stability tips. We emphasize on special conditions during Kayak Fishing. We learn also the various details of our journey. 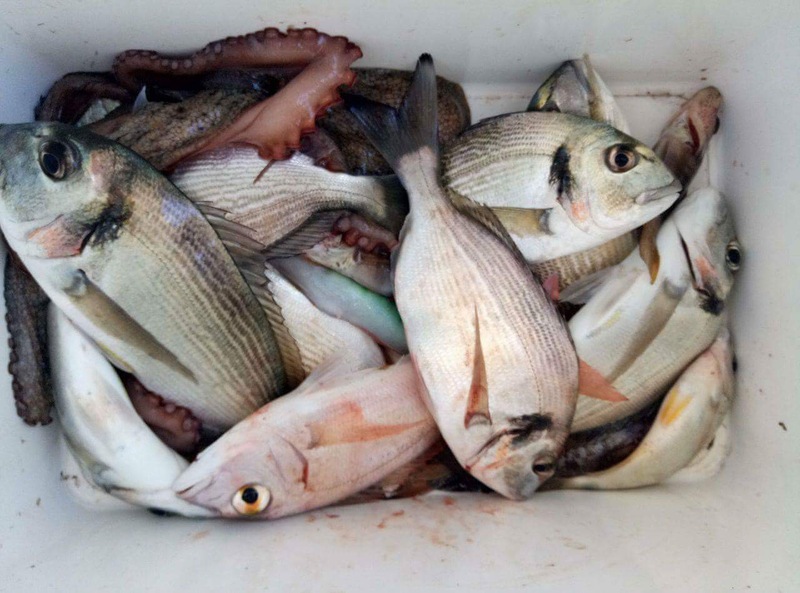 Departing from the protected location of Vourvourou resort, anglers are guided to the pre-selected fishing grounds. During this 30 mins trip, our professional kayak fishing expert will show and teach the essentials of trolling fishing from his sea kayak. Afterwards we are kayaking back to our Sea Kayak Halkidiki base to conclude the Guided Kayak Fishing Class. On the shore, we can have a short break, where we have the chance to get out of the kayaks, stretch our legs and enjoy a quick refreshing swim and snorkeling in the cool waters. On average this 5 hours Kayak Fishing Class includes a 30 minutes preparation time, 1 hour paddling exploration to the fishing grounds and 3 hours approximately on-board the kayaks for fishing and 1 hour free time for relaxation, snorkeling, swimming, photographing and more. . . Snacks, fruits and water are also included! Transportation: Transport available upon request. Additional fees apply. NOTE: Charges are made in USD at the exact daily exchange rate. Customers paying with credit cards in different currencies may incur nominal bank charges for transacting in USD. Please, contact your bank if in doubt about their charging policy. Also, please note that there is a 5.5% booking fee on all online bookings and payments. For your Guided Kayak Fishing Class, please come about 30 mins earlier your scheduled departure at our Sea Kayak Center in Vourvourou, Sithonia Halkidikis. Click here to find detailed driving directions.